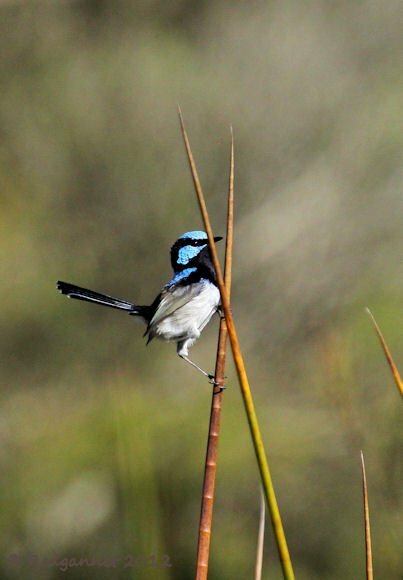 Following Duncan’s post about the Fabulous Fairy-wrens, you may be forgiven for wondering how many exceptional adjectives can be used in naming one genus of birds. 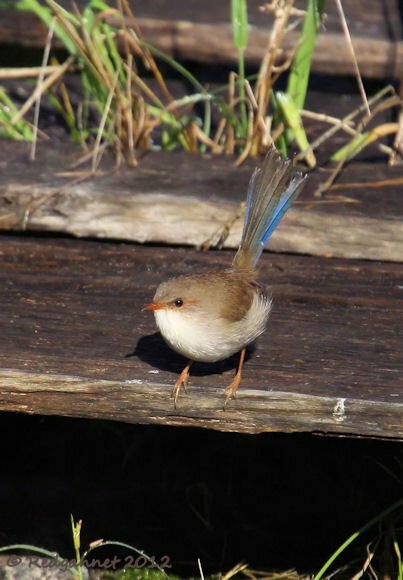 The Malurus clan must be a contender as the most gushingly named group, including as it does, the Lovely Fairy-wren, the Splendid Fairy-wren and the Superb Fairy-wren. The other family notorious for its excitable nomenclature is the Birds of Paradise which include among their number the Bloomin’ Gorgeous Bird of Paradise, Princess Stephanie’s Bestest Stonker and the Super-duper “Crikey!-did-ya-see-that-beauty?” Bird of Paradise (which incidentally also holds the title for the most syllables in a common name (and is also the only one to contain extraneous punctuation!)). 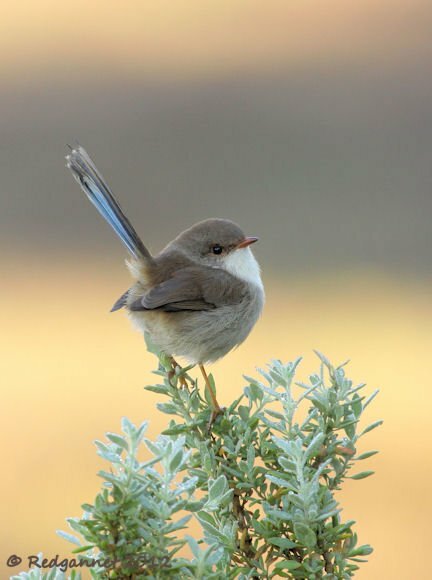 This post will look at the Superb Fairy-wren, Malurus Cyaneus, which can be easily found in a variety of habitats within the south-eastern corner of Australia. From suburban gardens to forests and marshes, they pop up from the cover of the undergrowth to investigate any unusual noises and respond very well to pishing. It is the male that earns the name with his superb blue head gear, mantle and tail. 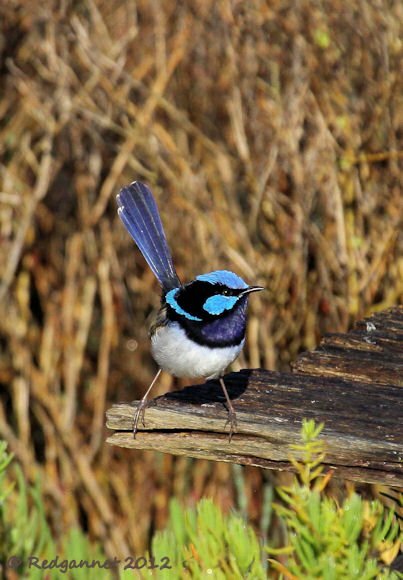 As one might expect from a bird whose name has been derived from wren, its tail is most commonly seen cocked high in a distinctive pose which can be recognised from distance. 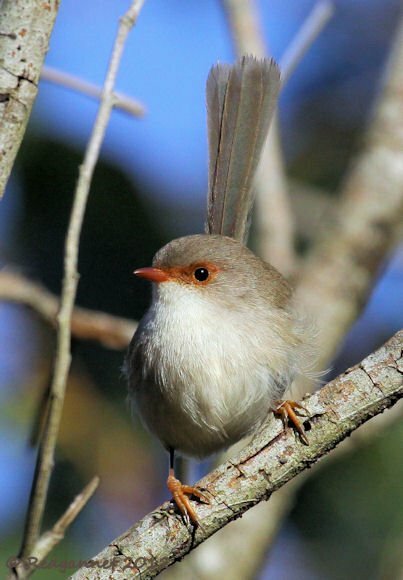 The female and juvenile fairy-wrens are somewhat similar across the genus and confusion could occur if they were seen in isolation. This is unlikely however as they form small, lively flocks which usually contain a male with his distinctive plumage. The non-breeding adult males pass through an eclipse plumage. During this phase it resembles the female, but its tail is shorter and the underside of its tail can be seen to be blue. Other members of the genus also pass through the eclipse phase when their appearance becomes close to that of their respective female, but each has its own individual deviation. The eclipse plumage of the male would not always show from head on, but if the tail is fanned slightly, the blue on the upperside of the outer tail feathers can be seen. All of the photographs above were taken during the first week of June at Bicentennial Park in Sydney Australia. Not only beautiful – they have loads of personality too. I much prefer the females.